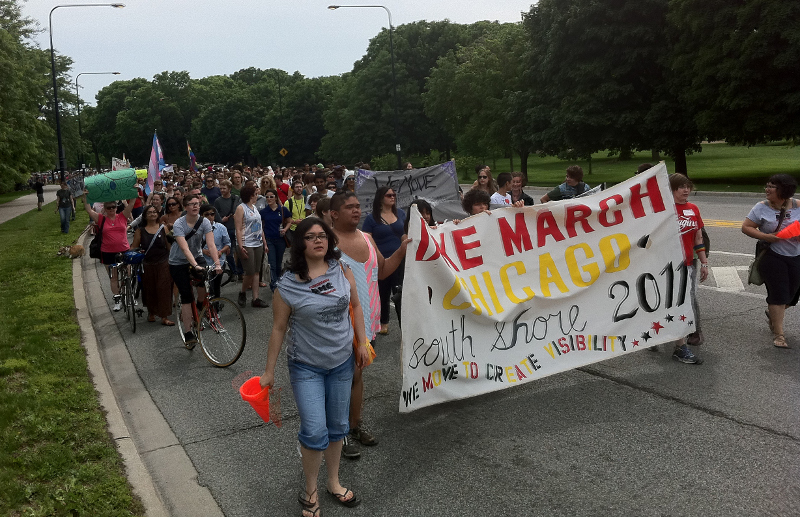 Lesbians, queer and trans people unite at Dyke March Chicago | Fight Back! Chicago, IL – Over 1500 LGBTQ folks came out to march at Chicago’s South Shore neighborhood for the annual Dyke March on June 25. This was the second year at South Shore, a predominantly African-American neighborhood, as organizers have rotated locations for the past several years in efforts to expand to the larger queer community outside of the historic Boystown and Andersonville neighborhoods of Chicago. Dyke March Chicago celebrates “dyke, queer and transgender resilience.” The march was a response to the larger Chicago Pride parade, by those in the lesbian and queer communities who wanted a more autonomous and political space, free from corporate sponsorship and male-dominated leadership. This year saw a diverse crowd – from queer Latinas from the 2009 Pilsen neighborhood dyke march to Black Southsiders, all marching in unity. Several energized contingents from various organizations marked this year’s march. Grassroots and community activist organizations such as Gender JUST, Broadway Youth Center, and Genderqueer Chicago wielded banners and shouted chants like "Tell me what democracy looks like? This is what a Dyke-ocracy looks like!" 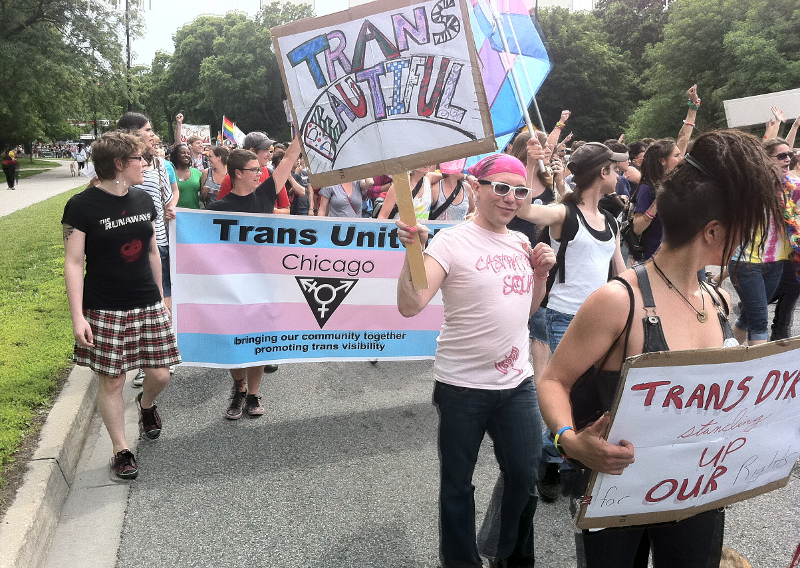 Trans United Chicago, a new contingent that promoted unity and visibility among the Chicagoland transgender community, marked one of the few political marches the trans community brough together in recent years. Various performers read political statements, performed music and poetry and pledged their continuing work around LGBTQ rights. Organizers in the Chicago Dyke March Collective are working together to accept submissions and build community relationships for the 2012 and 2013 marches.